Noel Campble - Sufferation / Gladiator Band - Sufferation Ver. 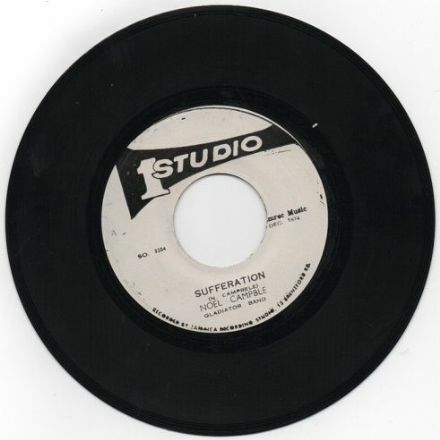 (Studio One) JA 7"
Sufferer's psalm featuring the Gladiators on the rhythm section and helpfully dated as 1974. PLEASE NOTE: These Studio One records are pressed in Jamaica using vintage stampers. In some cases this may result in warping, dishing, surface noise and other irregularities. Some titles will sound better than others, but the quality of each individual title's pressing is generally uniform. We feel that these issues are easily outwieghed by the quality of the music and the esoteric nature of these records. Don't order if you feel this may impair your enjoyment of the product. Check the sound clip for sample of sound quality.